Intel PIII/Celeron low power CPU Card available! Vision Systems announced the high performance and low power PCI bus CPU card - VS 2645. August 10, 2005 - Vision Systems GmbH-Industrial PC provider, announces the release of newest Intel PentiumIII/Celeron CPU cards - 2645 series. The 2645a card is a high performance and low power consumption half-size pci card with PIII 933MHz processor. The 2645 card comes with a 650MHz ULV Celeron Processor. 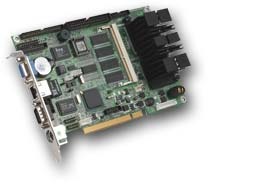 The cards have 2 PCI IDE interfaces and have all standard connectors like LAN, 2 serial ports, 1 parallel port and 4 USB ports. They also have a Compact Flash socket on board. Vision Systems offers a large variety on CPU boards. They are available in many standards like PCI, ISA, PICMG, All-in-one, ATX and ITX, offering processor power from 25MHz up to the latest Intel P4. You can find your optimal solution here. Detail Specification | Inquiry this product: Art No (397).